When you think caves, you usually think about large caverns of bedrock. 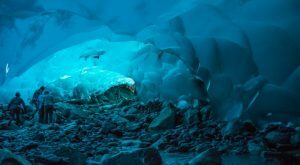 In Alaska, however, we also have caves of ice! 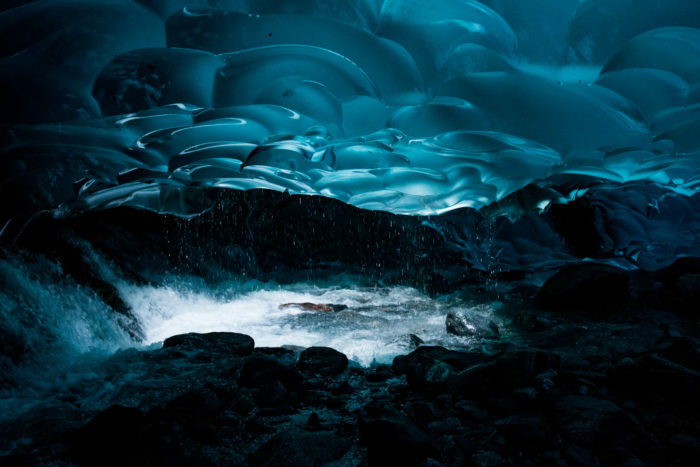 The Mendenhall Ice Caves are situated behind Mendenhall Glacier, 12 miles outside of Juneau, Alaska. The only way to access them in the summer is by kayak or the West Glacier Trail Hike. In winter, you have to hoof it across the frozen lake. 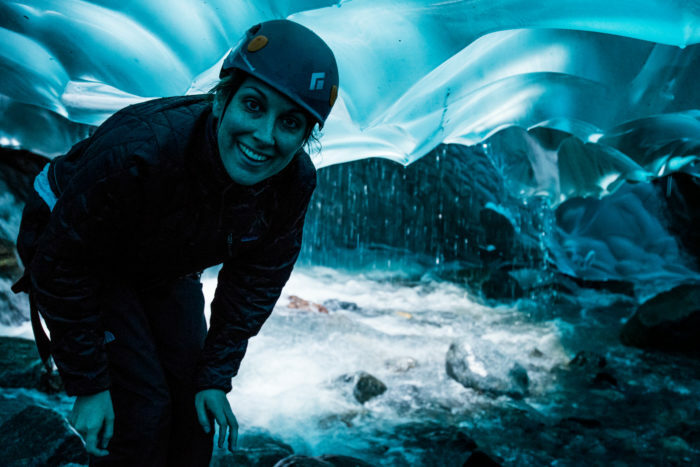 Either way, a guide is definitely recommended, as you will be traveling over the glacier to get to the caves, and navigating crevasses are not for the faint of heart! 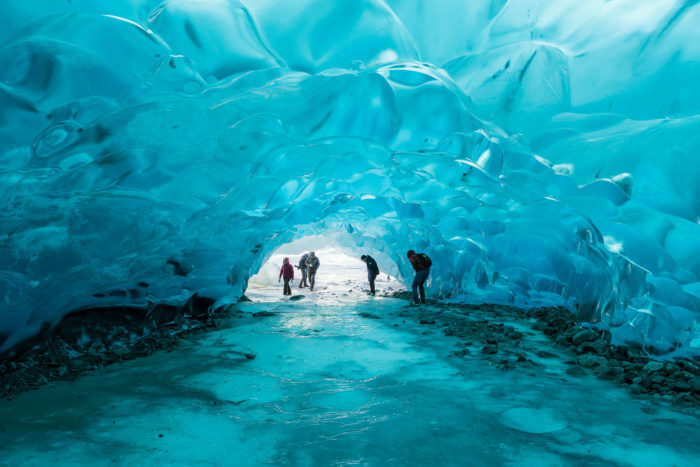 To get to the Mendenhall Ice Caves, you have to travel across Mendenhall Lake. In the summer, most people kayak out across the lake until they reach the glacier. In the winter, you're welcome to walk, or perhaps use a fat bike! There's also a hiking trail, the West Glacier Trail, that loops around the lake for about 4 miles before reaching the edge of the glacier. From there you can hike up the glacier towards the ice caves in the back. This is a strenuous, 8-9 mile round trip hike, with rock scrambling and elevation gain. However, the end result is worth it! Mendenhall Glacier is over twelve miles long. 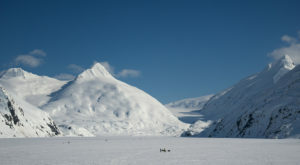 It is a part of Mendenhall Glacier Recreation Area and federally protected. It resides within the Tongass National Forest. The glacier was originally known as Sitaantaagu (or, "Glacier Behind the Town"). It's other name was Aak’wtaaksit ("Glacier Behind the Little Lake".) 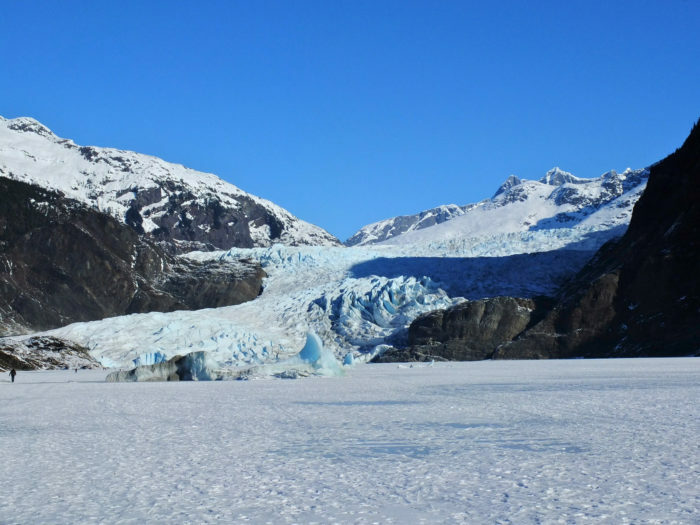 Mendenhall Glacier, due to warming temperatures, has receded almost two miles since 1958. It is actually due to these warmer temperatures that we have the ice caves! The glacier melts and forms this incredibly ethereal terrain. 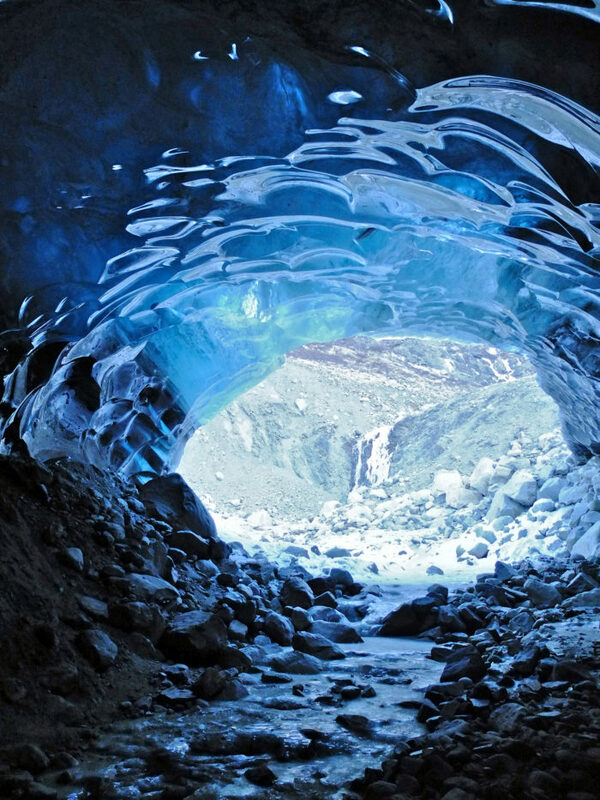 The caves are this stunning shade of blue because glaciers absorb all of the other colors in the light spectrum, and only reflect back the blue. This creates the color of these beautiful tunnels. 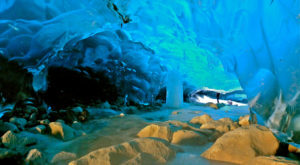 The caves themselves are created from the melting ice. 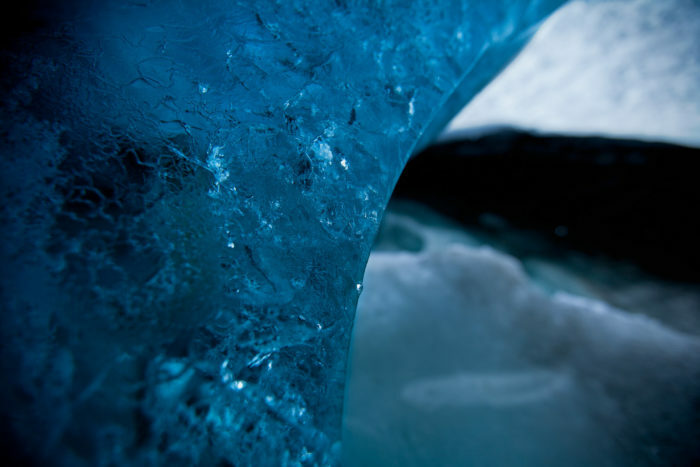 The water flows through holes in the surface of the glacier, called "moulin." As the water flows down through the ice, it creates these curvy passages. This means the caves themselves are constantly changing and shifting, depending on the weather. In fact, the weather plays such a huge factor in safety, that even companies that offer to take you safely to the caves can't promise that you'll be able to go in and see them. The ice structure can become too risky, especially during warm weather. On especially warm days, entire caves have been known to collapse! This is why it's best to trek out to the ice caves with guides who are able to read the safety of the ice. The Alaska wilderness is always something you want to be prepared for. As the trail to the ice caves isn't clearly marked, it's especially important to be able to know how to navigate. There have been instances of people becoming lost in the backcountry. Having the right equipment is important, as well! The weather in Alaska can change from bright sunshine to cold rain, so packing for all the elements is a smart decision. Also make sure to pack any safety gear you may need, especially if you are spending time inside the caves. A safety helmet is always a good idea! 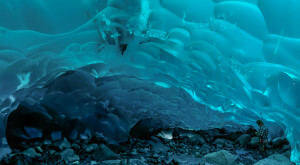 The Mendenhall Ice Caves are an absolute wonder to see! The photos alone have people longing to put this experience on their bucket list. It truly is an adventure that is hard to duplicate almost anywhere else in the world. The otherworldly trip is thrilling, and you should visit soon! 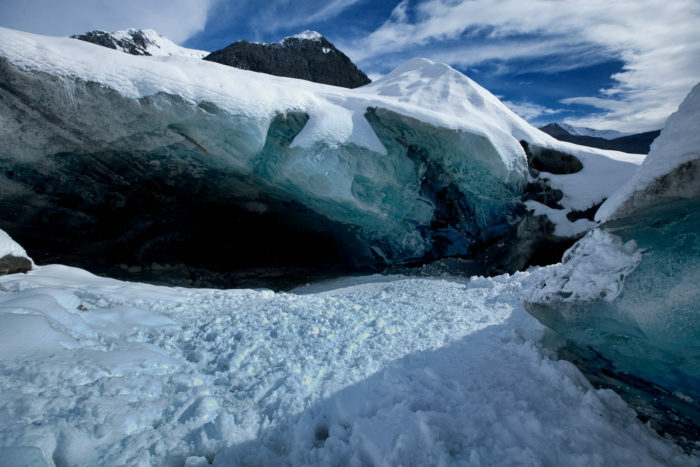 With the glacier melting, the caves are disappearing faster. Where else can you have such an amazing thrill? You can learn more by checking out the USDA Forest Service’s page on Mendenhall Glacier. Looking for a place to stay while you explore everything you can in Juneau? Check out this Luxurious Bed and Breakfast In Alaska, to relax after a long day’s hike!